We like this salad’s variety of flavors and textures. Today I used fresh cherries (but dried add a nice tartness), red quinoa, and sweet onion. Preheat oven to 350 degrees. Spread almonds on baking sheet, and toast approx 7 minutes, shaking pan occasionally, or until golden brown. Cool. Bring 3 cups salted water to a boil in pot over medium heat. Stir in quinoa. Reduce heat to medium low, cover, and simmer 15 minutes, or until all liquid has been absorbed. Lay 5 or 6 spinach leaves flat on top of one another on cutting board. Roll tightly into cylinder, then slice into slivers. Repeat with remaining spinach. 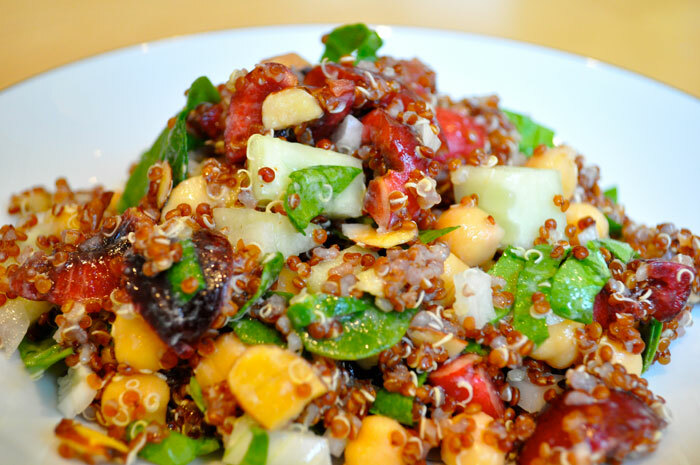 Toss together quinoa, almonds, spinach, cherries, cucumber, chickpeas, and red onion in large serving bowl. Whisk together yogurt, olive oil, lemon juice and garlic in small bowl. Pour over salad, and toss to coat. Season to taste with salt and pepper. Chill 30 minutes to allow flavors to develop, then serve.